Create those MAGIC MOMENTS on your Smoky Mountain getaway when you stay in this lovely 2 bedroom 2 bath cabin. 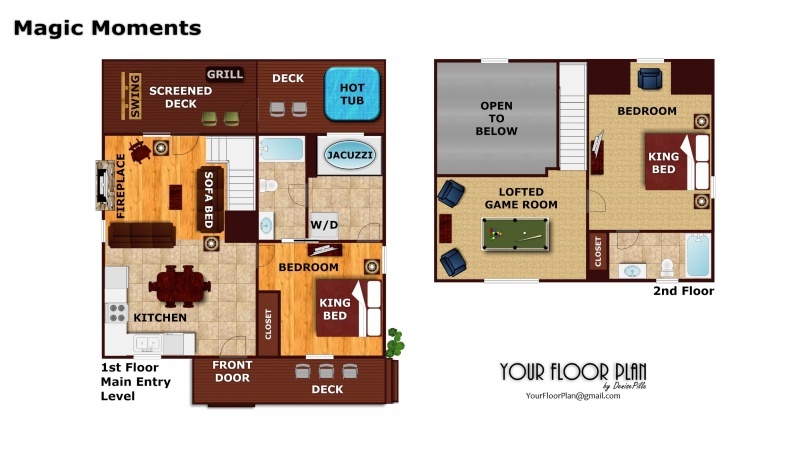 Guests will find two King master suites, each with their own attached bathroom, and on two separate levels of living! Downstairs a separate bath area opens to the King bedroom and includes an oversized jacuzzi for two. Inside, vaulted ceilings, a gas fireplace, and 3 LED TV's offer guests in-home entertainment. Don't forget your pool cue! A lofted billiard room overlooks the main living area. Outside a full length covered porch includes a screened sitting area with wooden porch swing and a covered hot tub porch perfect for a little R & R. MAGIC MOMENTS is conveniently located just a short drive back to Pigeon Forge and the Tanger Outlets, and without miles of mountain roads. Stop searching and reserve your Smoky Mountain getaway today. Your MAGIC MOMENTS are waiting! Impressed with Cleanliness and layout of cabinWe like to move around and stay in different cabins for a new experience If provided a discounted rate for same cabin stay in future, Magic Moments willbe a top pickThank you for easy reservation/check/in and out! Love American Patriots Getaways. Always great cabins. They go above and beyond to find you the perfect cabin. Absolutely the best cabin experience my family has ever had. Staff was amazing. The cabin was spotless and well decorated. See you next year! Loved that the cabin was decorated so beautifully for Christmas inside and out, was a pleasant surprise upon our arrival! Also we had an issue with the fireplace and someone was out quickly to resolve. We enjoyed staying at Magic Moments and , found every thing on hand that we would need.The only complaint that we would have is the tubs did not have mats in them and was slippery . Other than that would highly recommend this cabin for any one and , we are really looking forward to another stay . Thank you for allowing us the opportunity of staying there and , making great memories. We had such a wonderful experience, the location was just perfect, plenty of room. My husband was well pleased with it all. I loved everything. Thank you for making our stay so great. We had a great time the cabin was clean and neat i would return in the future for vacation purposes. We thoroughly enjoyed our stay and look forward to booking again later this year. The stay was unbelievable wonderful. The cabin was just as beautiful as the pic online 5 stars. I truly love it and the money I spent on the cabin was well worth it. Thank you for a great / lovely stay.